The blue of the oceanfront swimming pool matches the North Myrtle Beach blue sky and the blue Atlantic Ocean when you stand at Waterpointe I in North Myrtle Beach and gaze seaward. The ocean views are beautiful and inspiring from Waterpointe I condominium resort in North Myrtle Beach, South Carolina. This North Myrtle Beach condominium resort on the oceanfront boasts spacious North Myrtle Beach condominiums that feature a fully equipped kitchen, private bedroom, living room, dining area and oceanfront balcony. 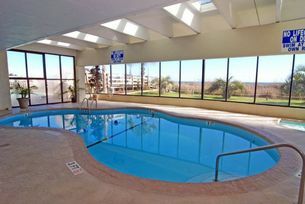 There is even a Jacuzzi tub and fireplace in each North Myrtle Beach vacation condo rental at Waterpointe I in North Myrtle Beach, South Carolina. High-speed Internet access is available throughout the Waterpointe I North Myrtle Beach vacation complex and each North Myrtle Beach condominium has a washing machine and clothes dryer for your convenience. Each North Myrtle Beach condominium at Waterpointe I has a private oceanfront balcony, an extension of your North Myrtle Beach condo’s living space. This private balcony at your Waterpointe I North Myrtle Beach condo rental is a great place to start the day. Brew your own coffee in the North Myrtle Beach vacation condo’s kitchen and enjoy your first cup of the day on the oceanfront balcony. The birds and waves will welcome you to a new vacation day in North Myrtle Beach, SC and the salty scent of the ocean will rejuvenate you better than caffeine. It is a beautiful start to a beautiful day on the North Myrtle Beach, SC oceanfront. From the underground parking at Waterpointe I to the indoor swimming pool and kiddie pool, Waterpointe I is a North Myrtle Beach vacation destination that is ready to spoil you. An indoor swimming pool at Waterpointe I means that your family can swim even when a North Myrtle Beach rain shower passes through. These North Myrtle Beach condominiums are only minutes away from all the North Myrtle Beach amusements you will want to visit during your North Myrtle Beach vacation. More than 60 miles of white, sandy beaches are spread out right beyond your private oceanfront balcony at Waterpointe I. Swimming, surfing and fishing are just the beginning of all that you can do on the beachfront during your North Myrtle Beach vacation. North Myrtle Beach golf is just around the corner. Myrtle Beach golf includes more than 100 Myrtle Beach golf courses so bring your golf clubs and play 18 holes every other day of your North Myrtle Beach vacation. Shopping, dining, water sports and live entertainment theatres are throughout North Myrtle Beach, South Carolina. Your family will have a ball exploring all there is to see and do in the North Myrtle Beach, SC area when you reserve an oceanfront condominium at Waterpointe I in North Myrtle Beach, South Carolina. Elliott Beach Rentals is not affiliated with onsite management or the HOA of Waterpointe I.